This dual-port generator features rapid heat-up and automatic temperature control. It eliminates the complicated setup and open flame typically associated with boilers and steam generators. A large-capacity reservoir holds 900 mL of water, which is enough to supply two work stations with steam for an entire class period. A built-in 800W heating element produces steam from a full reservoir of cold water in under 10 minutes and is completely enclosed for electrical safety. A special thermal-sensing circuit automatically reduces power before the water boils and shuts the unit off when the reservoir is empty. The large, hard-rubber reservoir lid carries two steam ports and acts as an overpressure release. When the reservoir is in use for heating experiments that don't need a lid, the lid can be easily removed. The one-piece metal design of the reservoir and top of the Electric Steam Generator make the unit easy to clean. It features an illuminated power switch, a continuously variable power control, and a low-water warning light. It is 20 cm in diameter, 30 cm high, and has a 2 m long power cord. 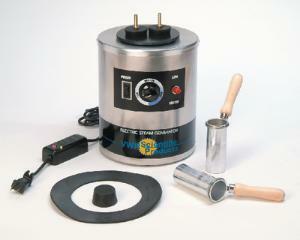 The generator supplies one specific heat dipper.